≈ Comments Off on The Great Monetary Bubble and the Recovery that Never Was. Across the ocean, a European finance minister is finally taking note and sounding a warning about what has been obvious for years. The world banking system has created a monetary bubble of mammoth proportions. As illustrated by the Federal Reserve Graph above, the velocity of the dollar (the speed at which money moves through the economy) has hit an all time low. In contrast the money supply has reached astronomical proportions. Something no central bank or even stock analysts working in the mainstream ever mentions. 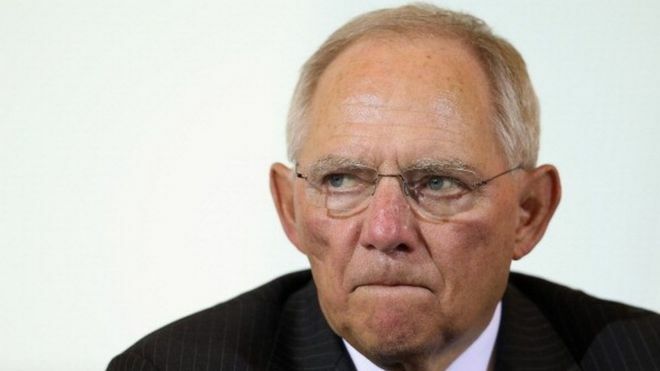 In a break from his compatriots the world over, German Finance Minister Wolfgang Schaeuble has declared the world to be in a monetary bubble. Not that this should be a shock to anyone who follows monetary policy, it has been quite obvious for some time. Wolfgang’s pronouncement made headlines, at least BBC headlines, but has caused little stir. The rumblings in China, the sudden drop of the DOW and other stock indexes has had many looking for an escape, but these are mere tremors compared to what is in store if the pent up energy created by central bank shenanigans is released. The graph above shows the dollar’s precarious position but similar graphs could be created for the Euro and the Yen as well. This leads to another conclusion that goes against the near universal refrain heard regarding the present “recovery.” A healthy economy would see Prime Rates in mid single digits, mortgage rates in the high single digits, increasing participation rates, increasing wages and a general rise in the standard of living. Since none of this is true, the conclusion that we are somehow in a recovery seems a bit far-fetched. What we are is in a Alice in Wonderland rabbit hole where reality has been bent by the central banks. In this world the movers and shakers are doing well as stocks have risen to new heights, but average citizens are hurting. While it is true that, if it weren’t for the drugging of the economy by the banks, the world would gone through more agony after the financial meltdown; it is also true a “real” recovery would of already been well underway. Instead, the price to be paid is likely to be much higher, and the recovery much more elusive, when the next financial crisis hits. Germany’s FM also said something else that reeked of common sense, he declared bank actions can’t be seen as a substitute for economic reforms. It should be noted that he was saying this after the pronouncement of yet another round of quantitative easing by the European Central Bank. Although he was talking to the EU community, his words where just as applicable to the United States as well. The real need to free up the bonds of over regulation and burdensome taxes have been ignored by world leaders, no need to free up economic growth when their is a central bank around. Additionally, addressing national debts as well as entitlement and financial reforms have been totally ignored as well. Hard decisions and hard choices that force people and their governments to live up to their responsibilities need to be made. The world is longing for strong politicians willing to break with the tide and stand for what is right, instead the world is awash with weak kneed individuals looking for the easy way out. People who continuing to dole out entitlements no one can pay for and engage in populist attacks on business (attacks that rave against big business but implement new taxes and regulations that mainly burden small ones), while relying on central banker’s ability to print and borrow money to cover over their inept policies. A pattern that reached its crescendo in the present century. The world will inevitably wake up from this fantasy world of economics; the weight of debts, entitlements, and the money bubble are just awaiting the last straw of reality to break the illusions back. Financial bubbles, whether they come in the form of stock over valuation, overpriced housing, or mammoth amounts of cash, all come to an end. As history has shown, their ends rarely come slowly, but as a crescendo of crashing waves of financial disaster. As for the monetary bubble, if there is any chance it to mitigate its effects the bankers and politicians have to first admit the problem exists! Something that for now has not happened. Instead they seem trapped in a Keynesian fantasy from which they have yet to escape. Consequently, the highway to economic hell continues to be paved with paper from the world’s printing presses.